Lafafa Catering has been getting a name for their wedding feasts but they can also cater for smaller parties and dinners. Get in touch for more information. Over the winter we have been experimenting with icecreams and sorbets. Pomegranate and blood orange sorbet and cardamom icecream with quince are 2 of our favourites. Both great for smaller numbers as we still havent worked out the logistics of serving frozen dishes on a larger scale. T’is the season of wedding tastings and we are offering a few of our firm favourites as well as some new dishes: a new bulgar wheat dish with pomegranates and peas – I know that might not sound promising but it really is a wonderful combination (no photo yet so thats the puy lentil with blue cheese. Please contact us on 01736 762755 for more information. 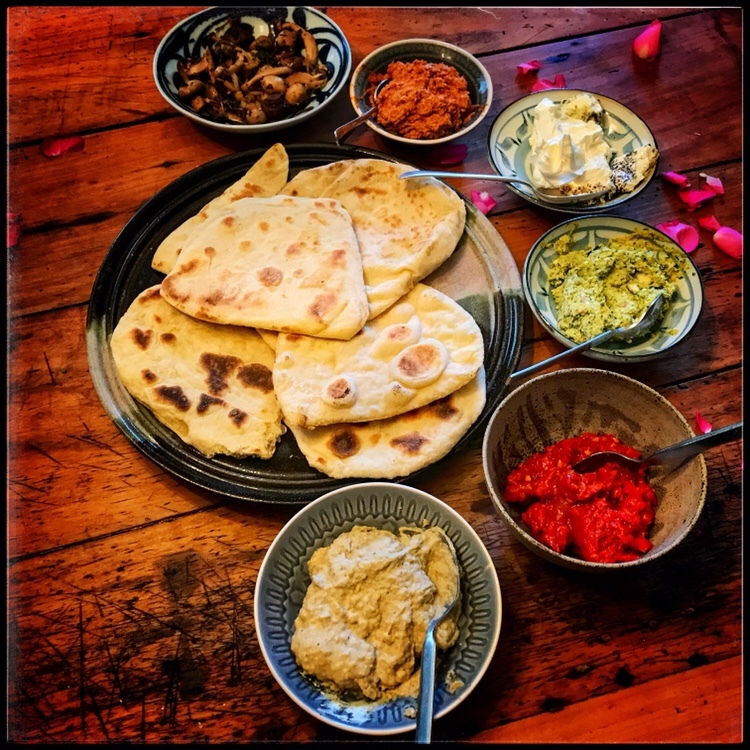 Last night we co-hosted a ‘friends Valentine’ middle Eastern feast with #potluckcornwall – fabulous evening. Lindsay and Annie of Lafafa catering are an absolute joy to deal with. We had chosen a venue with no catering facilities so we were looking for a caterer that could be quite flexible and self sufficient. From the first few emails it was clear that Lafafa would be perfect. They helped us choose a selection of dishes, and we came away from a delicious tasting session with absolute confidence that our wedding breakfast would be fantastic. Lindsay met us at the venue in advance of the reception to discuss logistics and she offered loads of helpful suggestions to make the day run smoothly and to maximise our budget. The meal that Lafafa prepared for us and our 80 guests was exceptional. The salads were just as fresh and the meat just as succulent as it had been during the tasting, and some dishes even came decorated with edible flowers which Annie had matched to our colour scheme – you would never have guessed that our venue had no kitchen. We had so many compliments on the food, and particularly from the traditional ‘meat-and-two-veg’ types who had been a bit nervous about trying something different. We can’t thank the Lafafa team enough. So happy we chose Lafafa for our wedding catering. The food not only tasted amazing but was so colourful! So many people commented on how great it was, and refreshing to have something a bit different. Thanks you so so much. Thanks Ella, who had a beautiful wedding on the Tracey Estate, Honiton. Lafafa Catering also did another wedding recently at Rame Head. and not a blog post in sight! We’ve been full on so far this season with several weddings and festivals, old and new. 2weeks ago we did a 3 day wedding at Porth an Alls, a very local venue and a fabulous wedding for the most lovely couple. 2 festivals this weekend and then another wedding the following weekend. Supper Club starts again on 3 February. Tickets selling fast so booking essential. It’s the season for wedding tastings. If you are still looking for a caterer for 2017 or you are wanting to book ahead for 2018 get in touch to book a tasting.